RoseOnVibes focuses on swing, bebop, and Latin jazz. You will hear a variety of standards by music icons such as Miles Davis, Duke Ellington, Milt Jackson, and Charlie Parker. And every once in a while you’ll hear a contemporary R&B tune, jazzed up just a bit. But what makes our music unique is the influence of African instrumentation and rhythms. 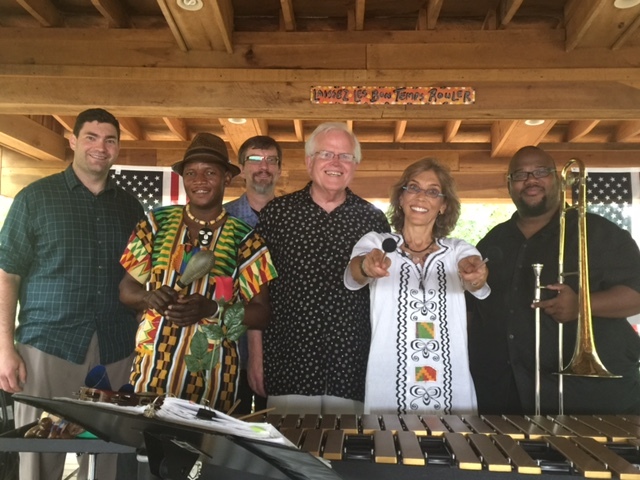 Rose incorporates into the music the African gyil (xylophone) and hand percussion instruments from around the world. You’ll hear jazz versions of traditional African music as well as some original compositions on the gyil. Sometimes the music is played with a kick and soul; other times we play quietly . . . with dignity, grace, and style. Whether it’s a jazz standard, an African tune, or Latin music, it’s played with just the right feel to make you snap your fingers and tap your feet. For a full and robust sound, we play as the RoseOnVibes Quartet or Quintet. For a quieter, more mellow sound, there’s RoseOnVibes Trio. No matter what the band’s instrumentation . . . watch out for a good time! Subscribe now to be notified about our upcoming gigs and other band news!